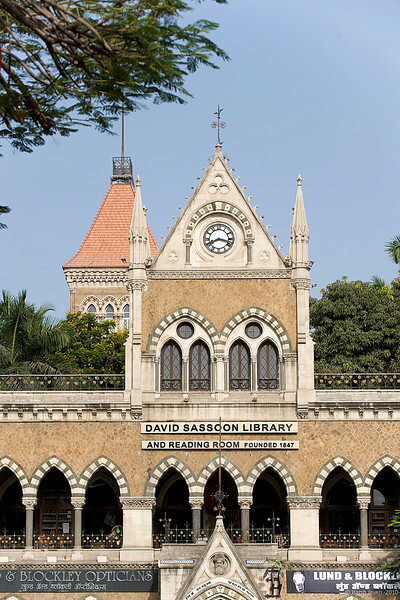 The David Sassoon Library is the name of a famous library and heritage structure in Mumbai, India. The idea for a library to be situated in the center of the city was the brainchild of Albert Sassoon, son of the famous Baghdadi Jewish philanthropist, David Sassoon. The building was designed by architects J. Campbell and G. E. Gosling, for the Scott McClelland and Company, at a cost of Rs. 125000. David Sassoon donated Rs. 60000, while the rest was borne by the Government of Bombay Presidency. The library is located on Rampart Row, looking across the Kala Ghoda. The building, completed in 1870, is built using yellow Malad stone, much like the abutting Elphinstone College, Army and Navy Buildings and Watson's Hotel. Above the entrance portico is a white stone bust of David Sassoon. Beautiful architecture. Thanks for the info and history.